"AND there was war in Heaven: Michael and his angels fought against the Dragon; and the Dragon fought and his angels, and prevailed not, neither was their place found any more in Heaven." Archaic sentences here and there in the world's scriptures tell us of the wars that were waged in Heaven before the beginning of time, and of the heritage--dim, prehistoric, supernatural in the natural--that was left from them to men and gods. What is it that makes this element of mythology so clear, what force has raised it in this one case to the significance which it attains in the Chandi portion of the Markandeya Purana? This is, above all others, the Purana of Bengal. But here the central figure of the drama is no archangel, mighty in power and beauty, but the Mother herself, personification of the creative energy, focus and centre of the visible Universe. Back and forth amidst the applause of Heaven does She pursue the ever-changing demons, and at the moment of her triumph, when, ten-armed, pedestaled on the living lion and sword in hand, She subjugates her foe for ever, She is portrayed as the image of Durga. Such is the story told by the scripture--half-epic, half-liturgy--from which are taken the texts that are recited over and over again from one end of Bengal to the other, with worship and fasting, throughout the great nine days, from the new moon of Aswin, until Dussera or tenth day. Here and there are those--monks in their monasteries, perhaps, or Brahmins in their homes--who recite the whole of the Chandi again and again. But for all alike, whether they do this or not, there is but one object of contemplation--the wars that were in Heaven; one hope, and one alone--the conquest of the demons by the gods. Everywhere in India the feast that corresponds to the Durga Puja is military in character. Perhaps fundamentally in consequence of the fact that, in the North at least, the rains are just over, the first seven days are spent in the cleaning and display of weapons; and on the tenth occurs the prostration and exhibition of skill in arms. Very curious is it at Nagpur on this day to see the last scion of the Bhonslas set out on the stately promenade that was, to his fathers, the beginning of a freebooting expedition, and long long before that, a hunting party. But domestically, in Bengal, it is a very different element in the festival that determines the feeling of the home with regard to it. The child to whose after life each flash of a waterfall is to, carry its reminder, more or less vivid, of Durga with crown and sword, does not in its childhood itself conceive of Her as the cosmic energy, appearing from amidst the ten points of the compass. For the Mother of the Universe shines forth in the life of humanity as a woman, as family life, and as country. Here She is the maiden, perfect in beauty, nun-like in holiness, whose past and future are a glorified wifehood, on whose rapture of devotion the eye of the Great God Himself has fallen, and who enters the Indian household, goddess and queen notwithstanding, as, after all, the little wedded daughter, returning for a ten-days' visit to her father's house. True, as the lad draws nearer to manhood, he must realise that the father of the guest is no less than Himalaya, and his daughter, therefore, the spouse of God--according to the legend, Mother India herself. But this only gives continuity and ductility to his idea of the myth. First Durga, the ten-days visitant; secondly, India, as Uma Haimavati; and lastly, Maha-Sakti, the Infinite Force; but always and increasingly as his power of recognition grows, that ceaseless energy which works without and around him towards the due subordination, by the forces of life and nature, of all that is vicious and unjust and out of place. With what tenderness and intimacy, then, does the Bengali child learn to conceive of his country and of God! It is a tenderness and intimacy which, beginning with the use of images, may become inherent in a language and characteristic of old races. The Mohammedan boatman of Eastern Bengal is not in his own person a worshipper of Durga, and yet the words "With folded hands before the Mother" may carry as much to him as to the Hindu heart. Beyond a doubt, however, it is its higher theological meaning which lends to the Durga Puja its overwhelming elements of civic pageantry and national comprehensiveness. Those who have studied religions as factors in social and political development must be conscious of the great variety of threads that are united in any single religious practice. What was it that made the Semitic races worshippers of God the Father, and India the land of the worship of the Mother? Can these vast tangles of social and geographical conditions ever be completely unravelled? And even so, does India stand alone in her personification, or is it not more or less common to the whole of Eastern Asia? Regarding this last point, it is perhaps the fact that what exists elsewhere in fragments and survivals has been preserved and developed in India as a coherent whole. And within India itself, customs and doctrines bearing on this worship, in more or less of mutual un-relation, in many provinces, are in Bengal gathered together and woven into a single perfect piece. Who shall say how old was the Chandi in this region when it was fitted into and accounted for, by the Markandeya Purana? And where can we go, outside the province, that some echo of the old-time Mother-worship does not fall upon our ear? Aman, the Mother, guards every village of the South. It was Bhowani, the terrible Mother, who led the Mahrattas to victory. The Mother, again, was worshipped by the Sikh, using his sword as her image. Kali was the patron goddess of Chitore. To this day the great birthday is marked, in the Punjab and throughout the North-West Provinces, by the Ram-Lilla, or miracle play of the Ramayana. To this day, in Mysore and all over the Dekkan, Dussera Puja is the chief festival of the year. To this day, in every part of India, the nine-days fast is performed by some member of every high-caste household. To this day, in Madras, in Behar, and among families of military tradition everywhere, is Virashtamy, the solemn eighth day, the occasion of the worship and the tribute of the sword. 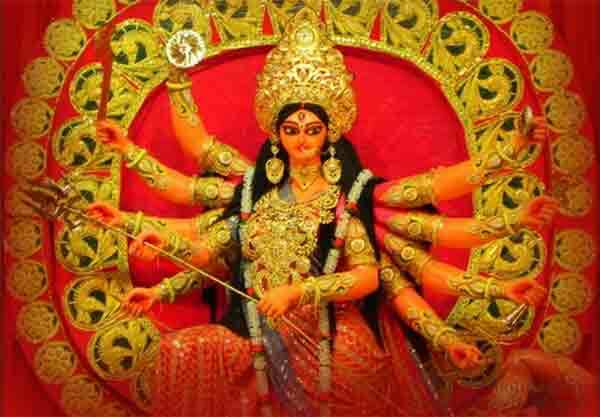 In Bengal, however, all these elements--social, military, and theological--are combined and rationalised in the characteristic conception of the Divine Mother as Durga-Kali-Jagadhattri: Durga, the divine energy, making and destroying, defeated and again conquering, impersonal and indifferent to personal desires; Kali, mother of darkness, wielder of destruction, receiver of sacrifice, whose benediction is death; and, finally, Jagadhattri, the tenderness of the heart of God, who shines in good women, and from whom came forth the Madonnas of the world. It is in Bengal, too, when the image of the Mother has left her children for a space, when the nine days of worship and of charity are ended; it is in Bengal that the great tenth day is kept as that of the reknitting of human ties, and the bijoya greetings of the family reunion go out throughout the length and breadth of the land. For are not all bonds of kindred indeed sanctified and renewed year by year at the feet of the Divine Visitant? Is not the whole of the country at one in the presence of the Mother? It is more than thirty years since Bankim Chandra Chatterji, the great Bengali romancer, sang the vision of the ended Durga Puja as the hour of the Motherland's need as he saw the image plunge beneath the waves. That the poet spoke the innermost thought of his countrymen, interpreting the yearly drama that belongs to each one in a national sense, however distant he may be in the sectarian; that he voiced in his poem what each household and each individual had known already in the heart, is proved by the history that has gathered round his song. Every year that goes by, the images of the Mother become more and more deeply, each in its turn, entwined with the thought of India to the Indian heart. Mother and Motherland--where ends the one and where begins the other? Before which does a man stand with folded hands, when he bows his head still lower, and says with a new awe: "My Salutation to the Mother!" From the Studies From An Eastern home by the Sister Nivedita (Margaret E. Noble) , author of "the web of indian life," "The Master As i Saw him," etc. With a prefatory memoir by s. K. Ratcliffe. Published in 1913 by Longmans, Green and Co. 39 Paternoster Row, London New York, Bombay, and Calcutta. While we have taken every possible precaution to reproduce the text accurately, we cannot guarantee the accuracy of the text. Please check the original hard copy edition for any research or serious study. Image Attribution: Images of Durga and Ravana in this article are licensed under Creative Commons Attribution 2.0 Generic license and Creative Commons Attribution 3.0 Unported license.